"Service Above Self" continues to be the guiding principle of the organization. 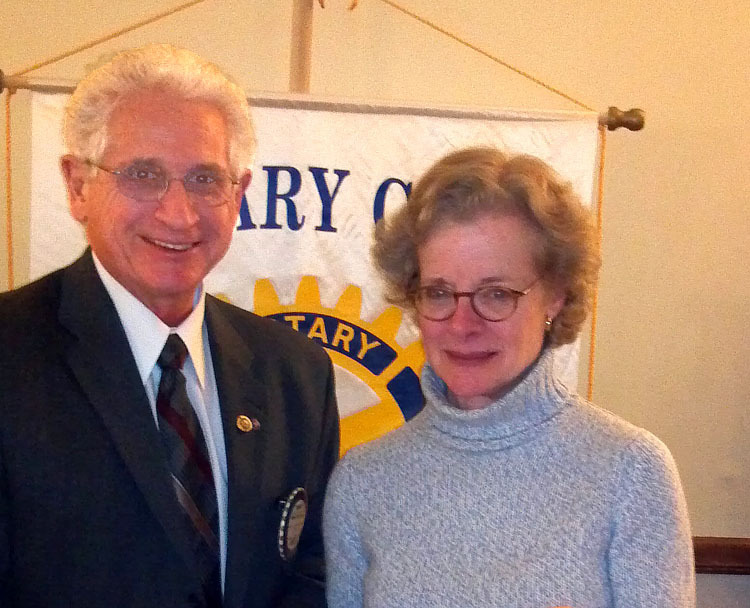 Club Rotarians gave $405 in December to the Give-A-Christmas Fund and to Penny Martin, the local "Advocate for the Homeless and Those In Need". This came from its "dinnerless dinner" and is what otherwise would have been spent for dinner at a regular meeting. Club Rotarians could be seen ringing Salvation Army bells at the Oxford Valley Mall in December and serving meals at the Trenton Area Soup Kitchen each month. And in the past few months the club has presented Paul Harris Fellow awards to nine of its members and to one community service professional, Darletta Berry-Johnson of the Ivins Outreach Center and the Morrisville 21st Century Community Learning Center grant programs. I keeping with Rotary's emphasis on the youth, recently various members of the club's Morrisville High School Leadership Academy have been guests at club meetings. Also in recognition of others working with the youth, the club honored the Boy Scout leaders in the area at its annual recognition dinner. (overlooked previously - ed.) 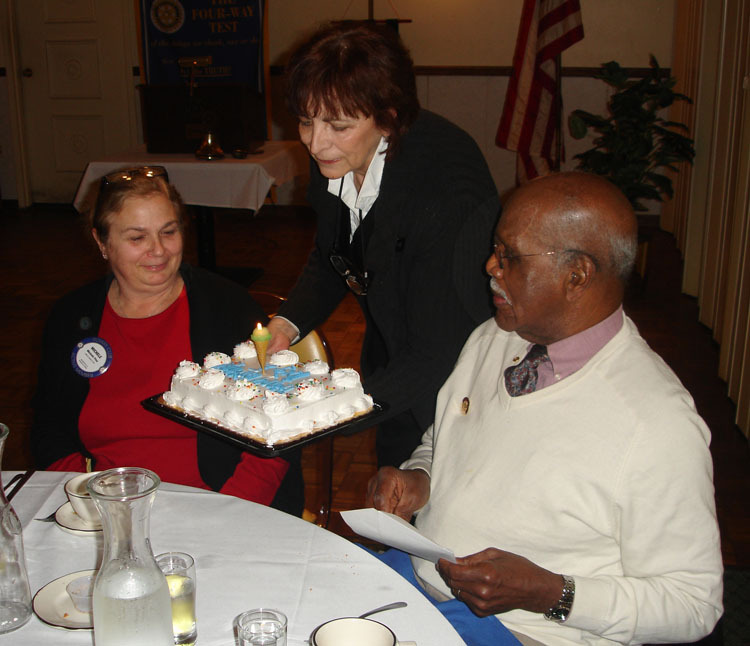 Back on October 18, 2011, Paul Harris Fellow awards were made to Rotarians Luisa and Juan Proano (right) by Foundation Committee member, Tom Miller and Club President Denny Lanctot (left). This was the second Paul Harris Fellow award for Juan, who is the current Foundation Chairman, making him a Multiple Paul Harris Fellow. 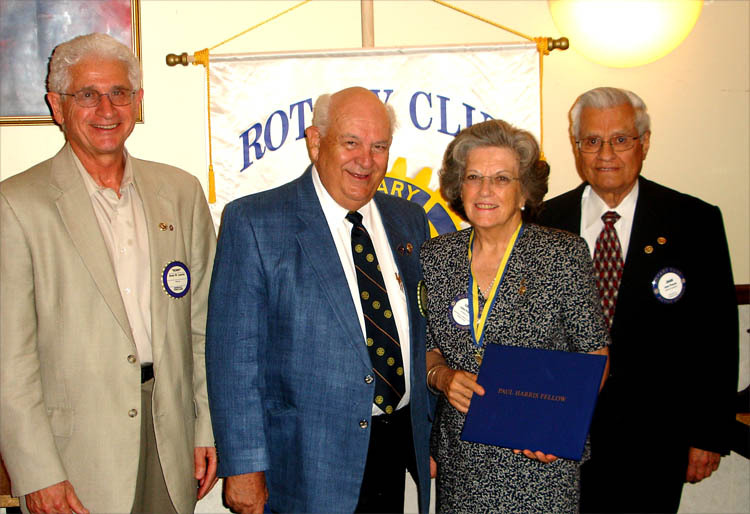 His wife, Luisa, was made a Paul Harris Fellow through his contributions to The Rotary Foundation and in appreciation of her support and service to their family, their church and the communities in which they have lived. 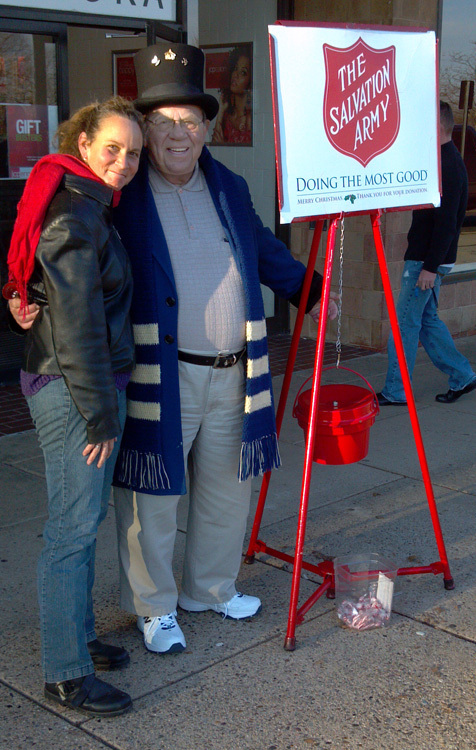 Representing all of the Rotarians who rang the Salvation Army Bells in front of Penny's at the Oxford Valley Mall are Rotarians Melanie Douty-Snipes and Barry Vannauker . 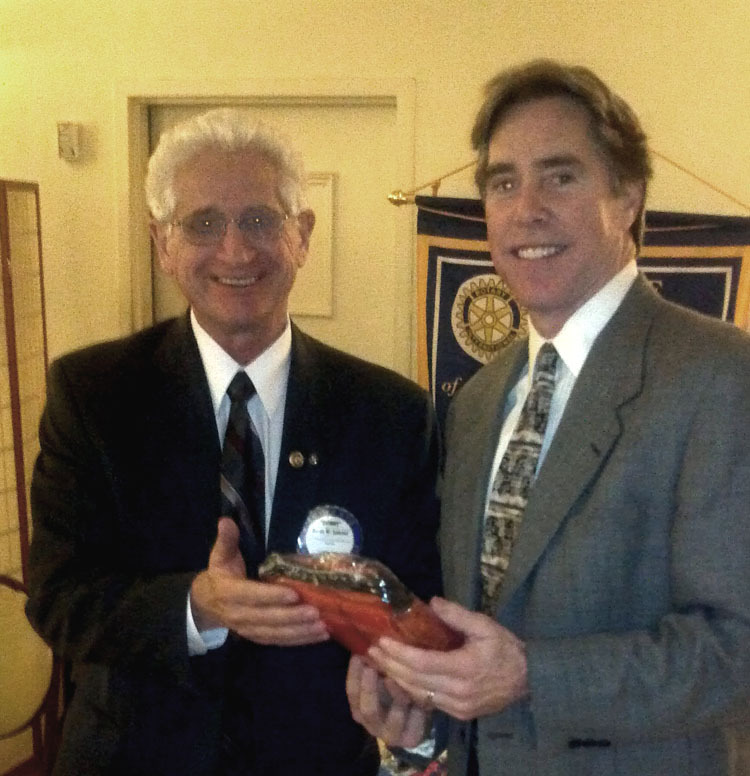 The club welcomed Claude Magnani as a new member, returning from the past! Andy Thompson conducted the induction ceremony and noted that Rotary brings people to us in the interest of Service Above Self . The combined resources of Rotary extend throughout the world. One hundred years after Paul Harris founded the organization there are over 1.2 million members, a great tribute to his vision. Andy said that Rotary is growing because of 1) it reaches out to good people, 2) good people reach out to us and 3) together in Rotary we get "good things" done. 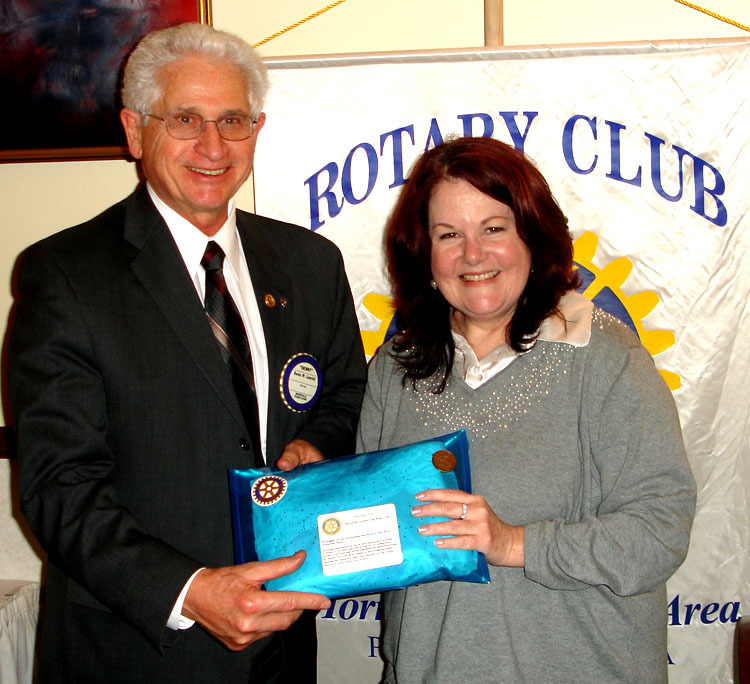 Claude's wife Vivian lends her support as President Denny Lanctot presents a new member packet to Claude. Ted Millard, Executive Director of Good Friends, Inc. in Morrisville, talked about the purpose of Good Friends and its programs. It is a halfway house located in a 300 year old farmhouse on the Snipes Farm property. It serves chemically dependent adult males, including those with co-occurring psychiatric disorders, who seek to re-establish themselves in the mainstream of society. It maintains a living atmosphere which is conducive to personal growth for men who are recovering from active alcoholism/drug addiction and who are aware that basic changes in attitude are essential for recovery. Ted said that the average age is 32 and ranges from early teens to the late 40s. They are people who have failed other programs and need to burn bridges to homelessness. They are given 2 to 3 weeks to find a paying job and are required to participate in strong, comprehensive therapy and 12-step programs. The first 3 essential steps are accepting 1) "I have a problem." 2) "Something can help me." and 3) "I will let it." Good Friends was established in 1977 as a non-profit 501c3 organization. Libertae, a halfway house in Bensalem for women, predates it and was the inspiration for the men's home. Originally it was called Bon Ami but an executive of the Bon Ami cleanser company saw its sign and worked with it to change the name. It has a capacity for 25 adult males. The per diem rate currently is $95.00 a day and Good Friends has fee-for-service contracts with agencies throughout Pennsylvania in the Delaware Valley and with the major managed healthcare companies. The staff includes 4 counselors with Bachelor Degrees and 2 with Masters, a licensed psychiatrist serving as a medical consultant, plus a transportation driver, a food services manager and a residence manager, all full time. The average stay in the live-in/work-out environment is 89 days. There are a number of required individual and group therapy meetings as well as peer group, community and education meetings. Ted pointed out that for every dollar spent on treatment, at least $7 is saved by taxpayers for health care, criminal justice and social costs. And while abuse and dependency rates of criminal offenders are more than four times that of the general population, no client has ever been arrested for his commission of a crime during his treatment period. For more information go to www.goodfriendsinc.org. Susan Taylor, Past President of the Yardley Historic Association, talked about the Historic Library in Yardley on Lake Afton. The original Yardleyville Library Company was established in 1845, she said, on the second floor of the Samuel Slack store, the site of the present Continental Tavern. The charge was $1 per year to use it. In the 1870's $5,000 was raised to build a new library. Community tradesmen donated services and in 1878 a "Carpenter Gothic" structure was built with a steep gable, square, slate roof. The design may have been copied from an old volume of poetry. In the 1940's it became part of the Bucks County library system and continued to serve as part of the system up to 1973 with an amazing collection of books. In the late 1950's there was a movement to replace the Yardley-Trenton bridge that was destroyed in the flood of 1955. Joe Martini, Editor of the Yardley News, stirred the pot to get the bridge site moved (now the Scudders Fall bridge). The new I-95 highway and access to the new bridge in Yardley would have taken out part of the Lakeside historic property and the library. John Yardley said he would donate $5,000 if the bridge didn't go through the town and subsequently sold 100 shares of MGM to pay his promised donation. Others also donated. In 1977 Bucks County decided to build a new library in Lower Makefield Township and the Yardley Historic Association, which had been formed in 1963, became the owner of the historic library. The association has had the exterior redone and is committed to preserving the history. There are a lot of photographs and a lot of history that has come from the minutes of the Yardley Civic Club, a women's organization. It also has an almost complete collection of the Yardley News. The association sponsors a number of community programs designed to involve people of all ages. More information can be found at www.yardleyhistory.org. Information about attendance policy and what to do in the event of an absence can be found on the club's website. Darletta Berry-Johnson, Executive Director of the Ivins Outreach Center in Morrisville, spoke about the Ivins Outreach Center programs and the Century 21 Morrisville Community grants that have been obtained. These federal program grants come through the Pennsylvania Department of Education and the latest is almost $500,000 over the next three years. The grants support an amazingly wide variety of enrichment programs and services for students of all ages and their families in the Morrisville community which is well beyond the capability of local organizations and government to provide independently. After her presentation, Darletta (center left) was made a Paul Harris Fellow in recognition of her dedicated service to the community as Executive Director of the Ivins Outreach Center and the leader in grant writing and partnership development for the Morrisville School District 21st Century Grants. Those receiving Paul Harris Fellow recognitions included (left to right) Rotarians Juan Proano, Manny Abalo, Denny Lanctot, Dave Sample, Barry Vannauker and (right) Hal Long. 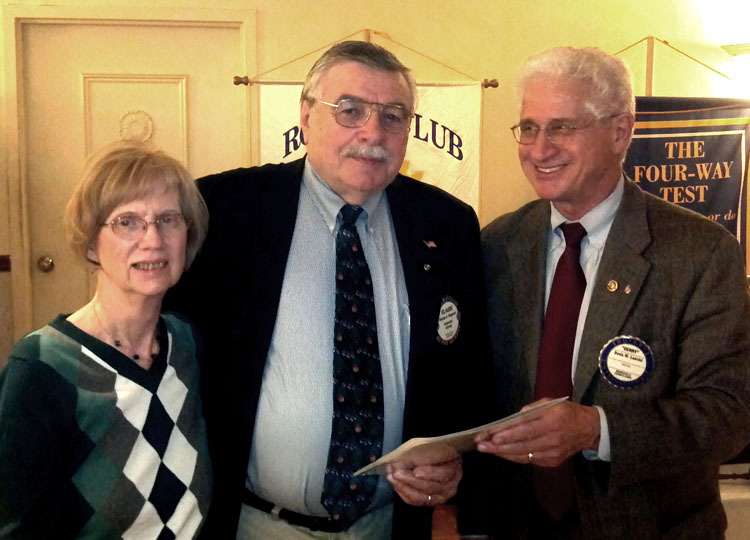 Tom Miller (second from right ) of the club's Rotary Foundation Committee made the presentations. Of note, Tom is a Foundation Benefactor, the next level beyond being a multiple Paul Harris Fellow. Paul Harris was the founder of Rotary. The Paul Harris Fellow recognition comes from two sources. The first is from each $1000 contribution that a Rotarian makes to The Rotary Foundation, which supports health, education and peace projects throughout the world. The second is from "recognition points" that are derived from each $1000 Paul Harris contribution. These points in the form of Paul Harris awards may be given to family members and others who have made a difference. In this case the Darletta Berry-Johnson award came from a Paul Harris Fellow contribution made by Rotarian Dave Sample. 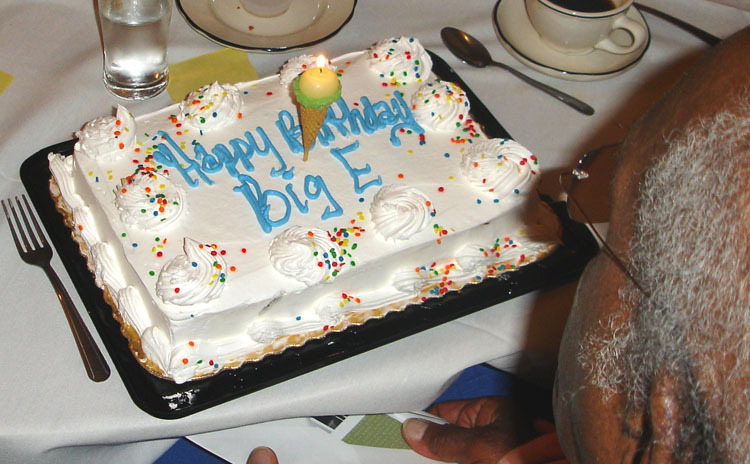 It was Big E's birthday! A surprise cake was provided by Michele Fina which everyone enjoyed. As part of the Ambassadors program, Michele Fina visited the Langhorne Rotary Club earlier in the week and did a banner exchange. 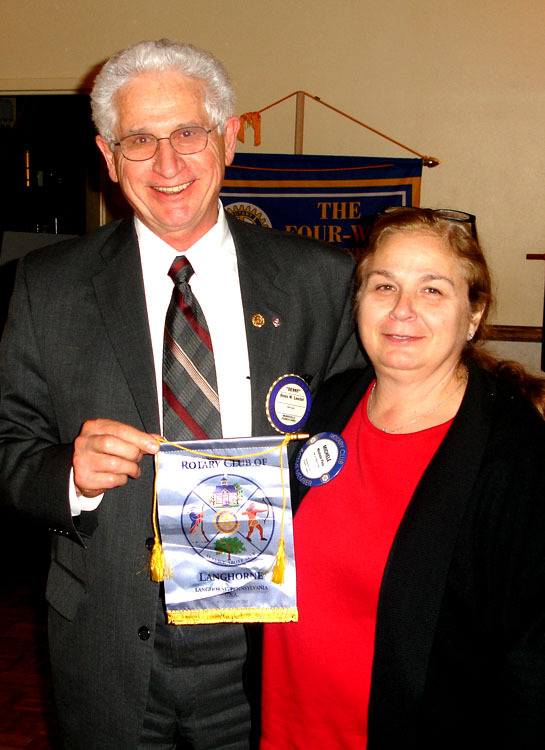 She presented the Langhorne banner to President Denny Lanctot. Speaker of the evening, Meg McSweeny, CEO of the David Library of the American Revolution, talked about the history and activities of the David Library. The library is 1.3 miles north of the Washington Crossing Bridge on Route 32 (River Road). It is devoted to the study of American History circa 1750 to 1800. It was founded in 1959 by Sol Feinstone, a businessman, philanthropist and collector of Americana. He named the library in tribute to his developmentally disabled grandson, David Golub. Mr. Feinstone started buying manuscripts and papers in the 1920's and eventually became a very serious collector of rare books. The library owns the Sol Feinstone Collection of approximately 2500 historically significant items. This collection plus its microfilm archive of some 8 million pages and some 40,000 books and pamphlets in both bound volumes and microcards make up a significant, centralized research collection. Author David McCullough called the collections "a national treasure of first rank, a window on our founding times like no other." The library is open free to the public and sponsors lecture series programs, movie screenings and local history tours. For more information go to www.dlar.org. Bob Shegda, Account Manager, Times Publishing Newspapers, Inc. in Morrisville, spoke of the establishment of the Morrisville Times some 15 years ago by Donna Allen. Her objective was to publish stories about good news. Since then she has added 7 additional newspapers and now is reaching some 103,000 homes and businesses with a readership of approximately 258, 000. Recognizing the widespread coverage of the newspapers, Bob encouraged the submission of press releases and the placement of advertising. Two new features are being added shortly, he said. One is a Volunteer of the Month award and the other a Hometown Hero award. The Hometown Hero can be a serviceman, a favorite teacher, a favorite mom or dad, etc. 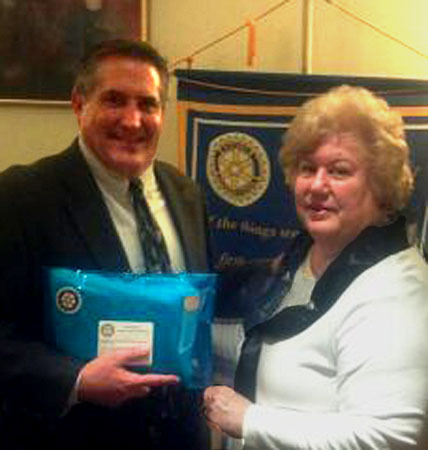 Bob Shegda was given one of the Rotary club's first aid kits by Vice President Barbara Nuzzolo as a token of appreciation for his talk. 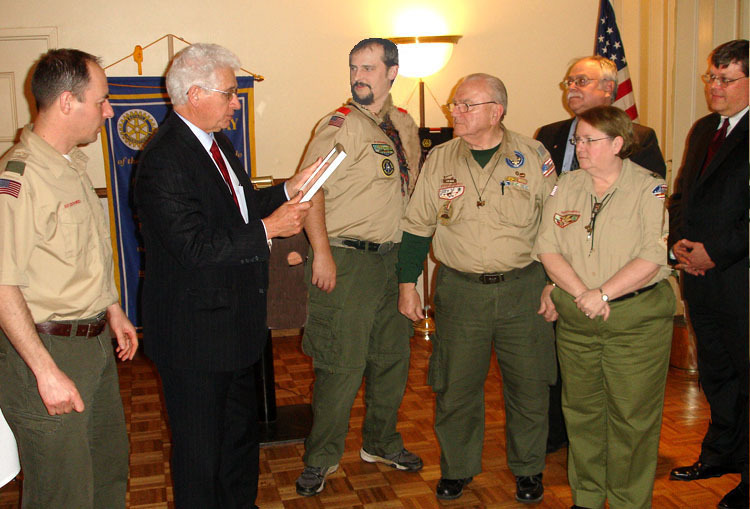 The club again honored the Boy Scout leaders in the area with its annual appreciation dinner. Magne Gundersen, CEO of the Bucks County Council of the Boy Scouts of America, summarized the history and structure of the 102 year old organization. Approximately 5400 youth were served the past year and in 2010 there were 177 new Eagle Scouts. Club President Denny Lanctot presented a certificate of appreciation to those representing the council. 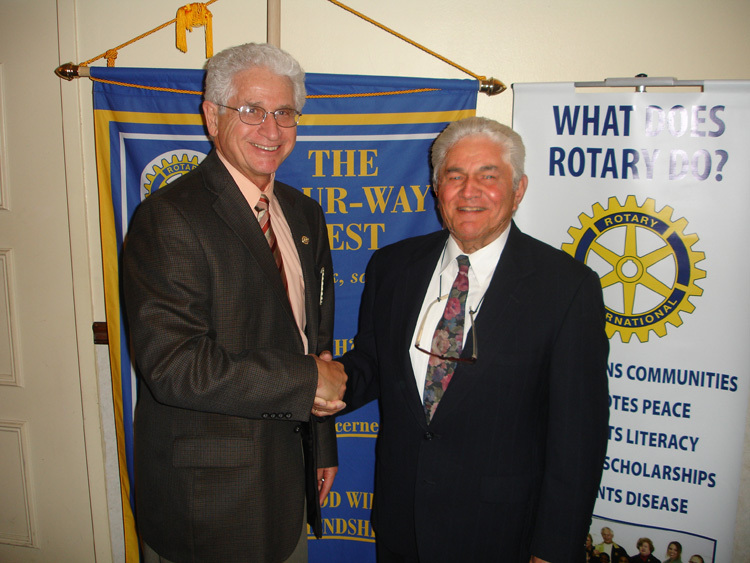 Claude Magnani reported that he and Hal Long had visited the Shady Brook Rotary Club, as part of the Ambassadors program. The Shady Brook members were invited to the upcoming Gourmet Breakfast and to bring their family and friends. In turn the Shady Brook Club extended an invitation to participate in their upcoming Golf Outing, with details to follow. 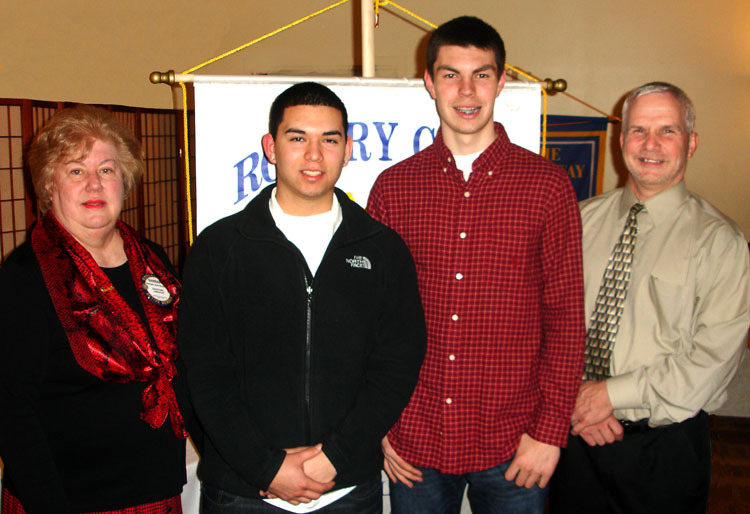 Rotarian and Morrisville Superintendent of Schools, Bill Ferrara, brought two of the members of the Morrisville High School Leadership Academy to the meeting, Nick Costello and Kevin Munoz. They spoke about their upcoming Student-Faculty basketball game on March 19 which is a fundraiser with the proceeds going to Save the Children Foundation for needy kids around the world. A few weeks earlier Casey Hollopeter and Jenna Souyack attended one of the club meetings and spoke of the activities of the Academy.